← The Chequers E17 – looks like they made it! The shopkeepers in our local Sri Lankan supermarket just smiled and said it was ‘difficult’, well in that case I’m definitely in the race. 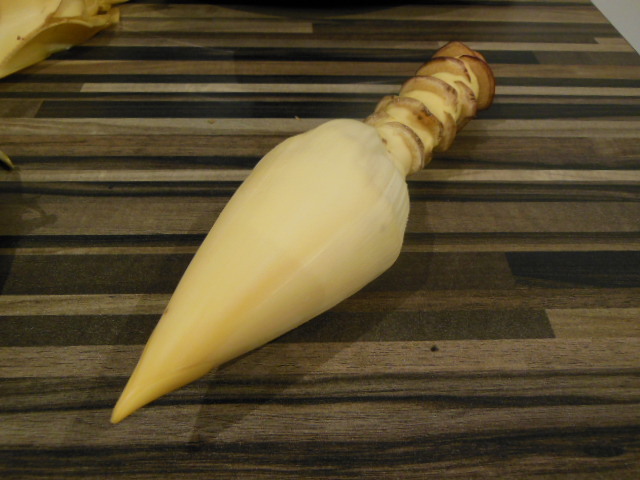 So I bought a banana flower. That was the first challenge, to figure out what it was, but hey that’s why Google was invented. Next with the assistance of YouTube I worked out which bits are edible and the rest is history… or a very healthy vegetarian curry. 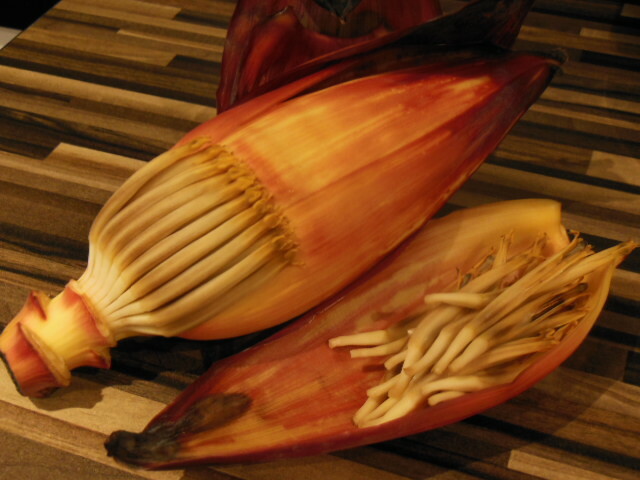 Banana flower is rich in potassium and vitamins A, C and E.
Remove the beautiful big, red leaves and as you go break off the blossoms, stop when the leaves are difficult to peal off. Keep the blossoms and central heart, throw away the leaves. Once you have a pile of blossoms then the real work begins. You need to open each stem up, remove and throw away the stamen and tough outer feather (if there is one) – this is an hour of your life that will never get back, but it is worth it! Chop the centre of the flower into thin strips. 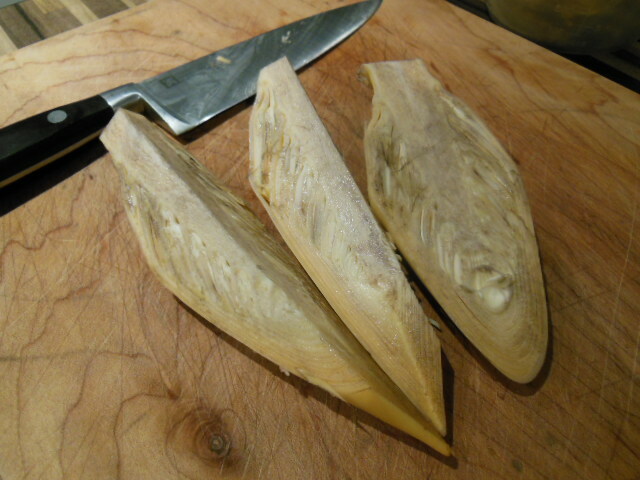 It’s a bit like preparing a Jerusalem artichoke heart. Peel and chop the potatoes into cubes. Chop the onions. 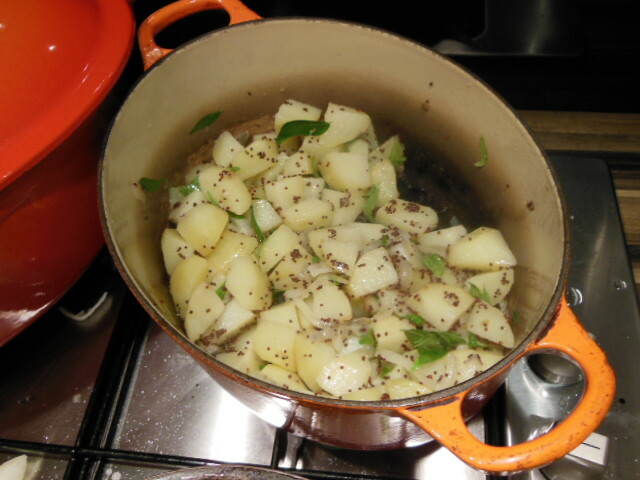 Heat the oil in a frying pan, add the potoatoes and onions and fry gently with the mustard seeds. Add about 100ml of water and reduce the heat to a simmer. 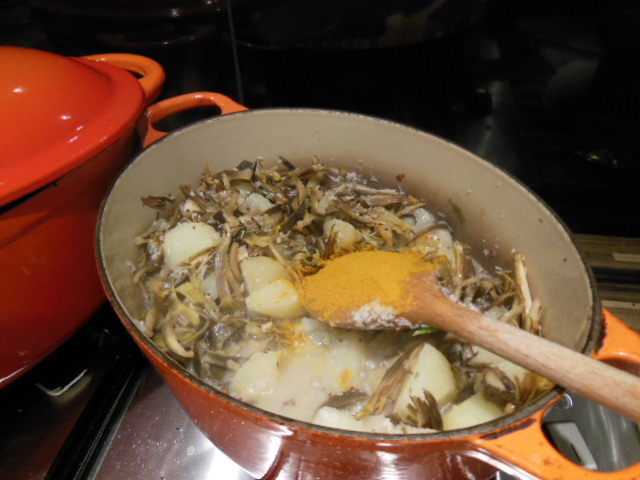 Once the potatoes are softening, add the prepared banana blossoms and flower heart, and curry leaves, fry for a few minutes. Next add the tomato paste, turmeric, the remaining water, chilli, coconut, salt and lemon juice. Simmer for 20-30 minutes until the banana flower is thoroughly cooked and softened into an intriguing curry. It has a slightly bitter sweet flavour with a tang of the plaintain or banana that the flower had intended to grow into. It is an unusual vegetarian dish and works well served with rice or nan bread. 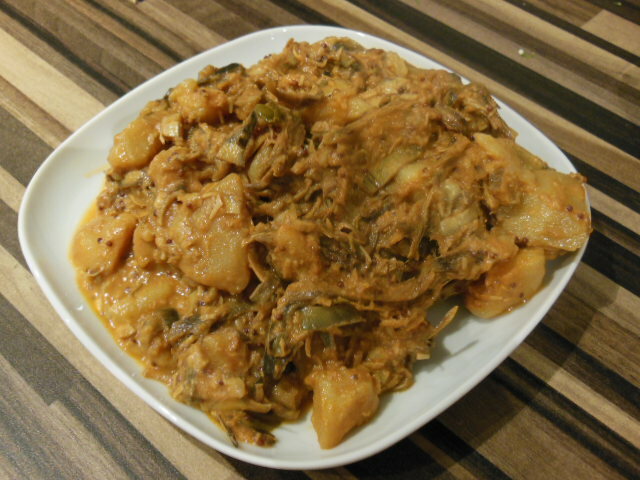 This entry was posted in Recipes and tagged Banana, Banana blossom curry, Banana flower, Curry, Fruit and Vegetable, unusual, vegetarian curry. Bookmark the permalink. Now that’s a new one on me……brilliant well done something unusual and if I can lay mine hands on the basic ingredient will give it a go!